I remember as kids when my brother discovered the Teenage Mutant Ninja Turtles with his friends and so I was really pleased for my boys when Nickelodeon came out with an updated band of turtle brothers that still embody the vibe and feel of the original series. 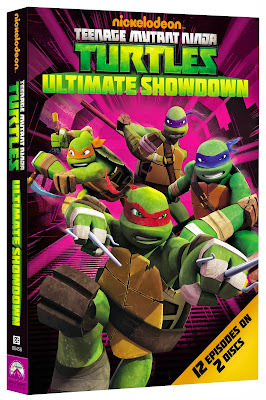 The Teenage Mutant Ninja Turtles: Ultimate Showdown contains the last twelve episodes (including the double length final episode) of the first season of the new and improved TMNT! As a mom, I appreciate how well written each episode is and how much fun all the characters are - with their quirks and strengths - it makes for fun family entertainment!